NEON is the second in DR's SuperStrings series. Super bright in day light, and with stage lighting. DR's NEON strings are so bright in appearance "they look like they are on fire." 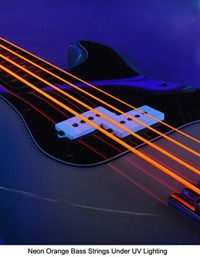 DR's NEON strings shine brightly under stage lights, and are 100% black light active so they glow strongly under UV lighting.